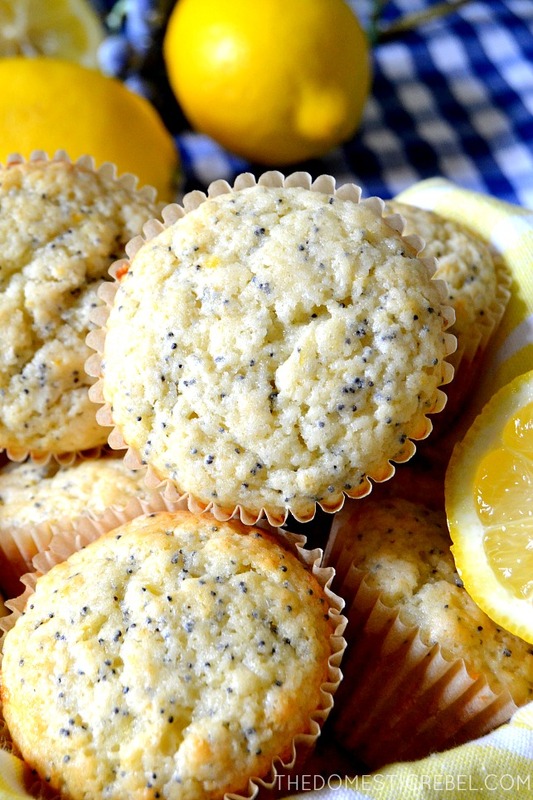 Bright, zesty and bursting with fresh flavor, these Best Ever Lemon Poppyseed Muffins are a staple for any breakfast or brunch table! Sorry I’ve been MIA lately! To be honest, I’ve been in a weird funk. I’m not sure what started the funk, but the funk is real. (I promise I’ll stop saying ‘funk’ now). I’ve been blogging since 2011, and back in the old days, I would post sometimes 5x a week. 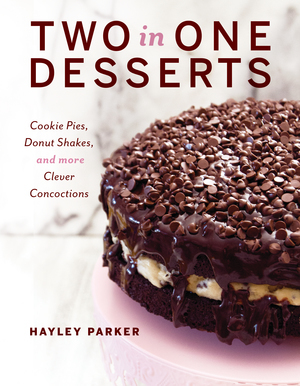 I’d say I have about 1,500 recipes on my blog – maybe more? So to come up with unique things every week is a challenge, to say the least – however, one I enjoy very much. But lately? I’ve just been MEH all around. Meh about my wardrobe. Meh about food in general. Meh about TV shows. The one thing I’ve been normal about? I am DYING to read books. All books. I cannot get enough. I’ve been sitting outside on my covered porch reading for hours a day, just soaking up the information and storylines like a bee starved for pollen. I don’t feel depressed, per se – just like I need a big, mental break. However, I don’t really have the luxury of just taking a break – this blog is my primary source of income, after all. But hopefully I can get into the groove again soon and you’ll see more of me (when I can tear myself away from my latest obsession: medical examiner memoirs). ANYWAY, sorry for the rant – just had to get that off my chest. 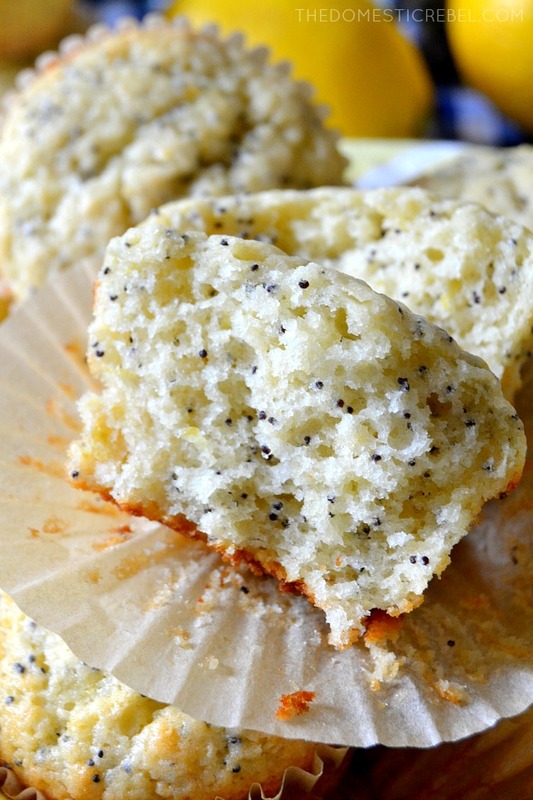 I also have to get this recipe for these amazing Lemon Poppyseed Muffins out into the world. The world needs them because they’re like a big, fresh hug from a long-lost relative. 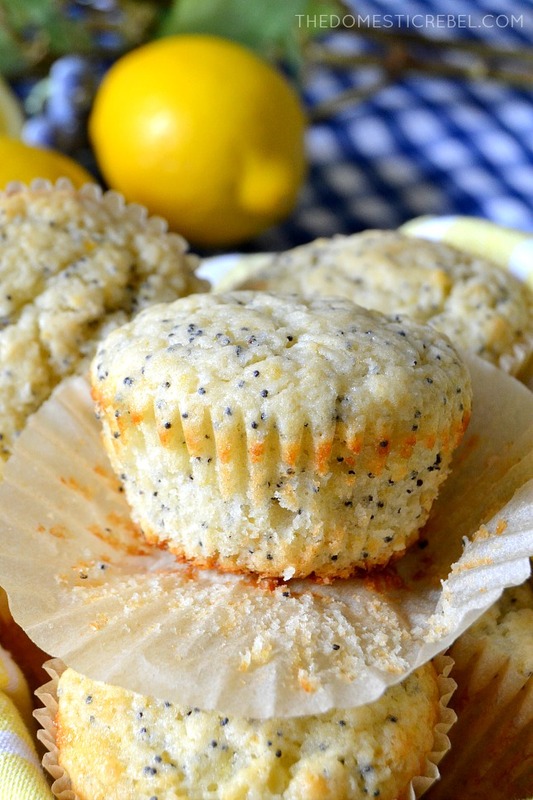 Normally, lemon poppyseed isn’t a go-to muffin flavor for myself. I am a blueberry or banana nut die-hard. But the lemon trees in my apartment complex are beginning to bloom and I was feeling like something bright and zesty needed to happen ASAP. Hence, these muffins were born! The base is the same as my Best-Ever Blueberry Muffins, and if you haven’t tried those, what are you waiting for? Instead of blueberries, I added lots of fresh lemon juice and zest for a seriously fresh kick of flavor. I also tossed in some poppyseeds for crunch and a cute polka-dotted muffin. If poppyseeds aren’t your thing, substitute them for fresh blueberries for a lemon-blueberry mash-up! But if you, too, are feeling uninspired, I highly suggest whipping these muffins up and celebrating the beauty of good, simple food in one tasty muffin! 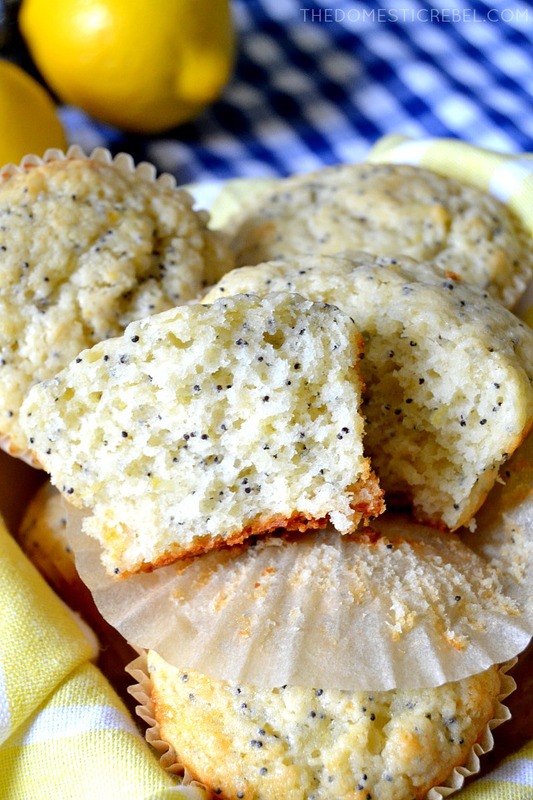 These Lemon Poppyseed Muffins are so fantastic, bright, zesty, moist and fabulous! Your search for the best muffin recipe is over! Preheat oven to 425 degrees F. Line 2 muffin tins with about 20 paper liners. Set aside. Meanwhile, in a large bowl, whisk together the flour, baking powder, and salt. Stir in the lemon zest, oil, sugar, eggs, buttermilk, lemon juice, and vanilla extract until a soft but lumpy batter has formed. Gently fold in the poppyseeds. Do NOT over mix the batter - it should remain pretty lumpy throughout, as overmixing results in tough, dry muffins. Drop two heaping Tablespoonfuls of batter evenly among the muffin cups, filling about ¾ full. 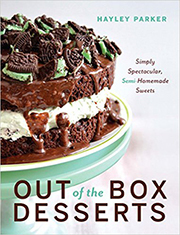 Bake for 5 minutes at 425, then reduce the oven temperature to 375 degrees F. for 15-20 minutes or until a toothpick inserted near the center comes out clean or with moist crumbs. Cool for about 10 minutes before serving. Serve warm or at room temperature. Store muffins covered, airtight. 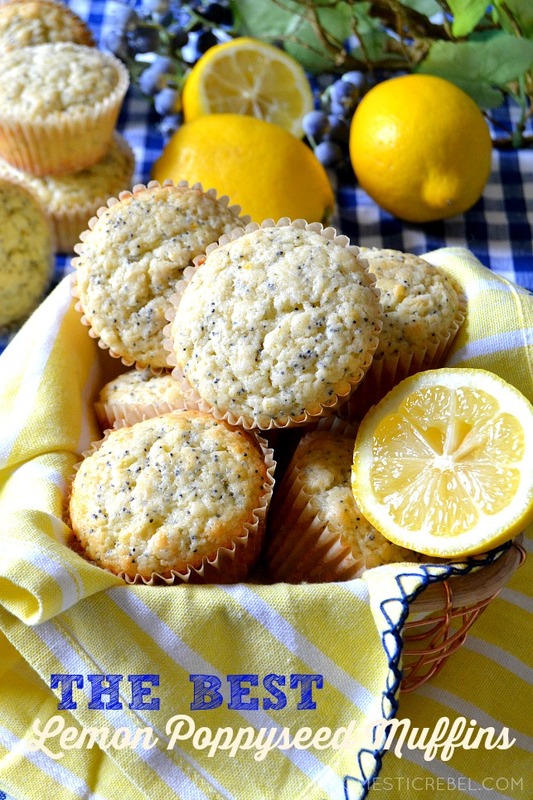 You’ll love this bright, juicy flavor and the moist, fluffy texture of these muffins! 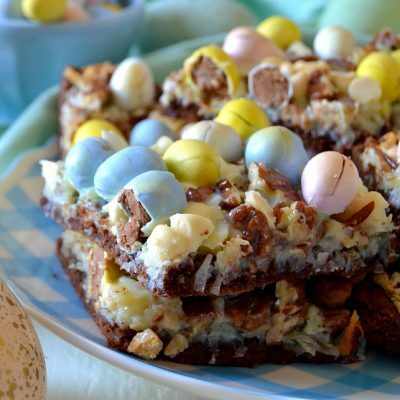 I made these yesterday and they came out delicious. I used coconut oil which made an added challenge. I didn’t read the whole recipe before so I kept all dry ingredients together and then added the wet. Unfortunately the coconut oil solidified with the eggs and buttermilk and it made it a challenge but I won and they are very good. Next time I will definitely have canola oil instead of the coconut oil. Thanks for the recipe. Made them again with canola oil and they came out perfect. Love these muffins.